DURAND NAIDOO and Thuso Mhlambi, childhood friends, have realized a lifelong ambition by becoming the first 100% black owned ship-owners in South Africa. Signed and delivered. Pres Cyril Matamela Ramaphosa, congratulating both Durand Naidoo and Thuso Mhlambi (Linsen Nambi) at the Youth Day event, Orlando Stadium-Soweto. The 33-year-old owners of Linsen Nambi, the company they started in 2012, made maritime history as youth owners when they bought Grindrod’s Unicorn Bunker Services. With their female empowerment partners, Women in Oil and Energy, they became the role model for the Government’s initiative to unlock transformation in the maritime – and liquid fuels – industries. Said founding member of Linsen Nambi, Durand Naidoo: “Linsen Nambi is a 100% black youth owned shipping company with highly skilled maritime professionals, strong customer relationships and owns its own ships. He says the deal took a “concerted effort” from the private sector (Grindrod), government (IDC) & oil majors (BP, Engen and Chevron). Linsen Nambi’s other founding member, Thuso Mhlambi said there was a great need for the private sector and the funding institutions to “better align themselves to Governments Development Plans to unlock more deals like ours”. Naidoo and Mhlambi have set a goal: to become the leading African shipping company with a global presence. They already employ 110 people, a number they hope to increase significantly as they grow the business. Since the inception of Linsen Nambi six years ago, the company has bought three bunker vessels in the ports of Durban and Cape Town. The story of the inception of their company is one of a friendship that goes back to 1996, when they were both 10 and in grade 4 at Montclair Senior Primary School in Durban. The men say that they stuck together when they progressed to the New Forest High School in Yellow Wood Park, Durban. They say they were “swept up” in the new South Africa and that while they weren’t “born free” they were old enough to understand there was a change in the country, “one that we could capitalize on”. “We walked home from school every day fantasizing about how rich we would be, the cars we would drive, the many businesses we would own and, of course, helping other poor kids. They took different forks in the road at the University of Kwa-Zulu Natal. Naidoo got his Bachelor of Commerce in Accounting degree but says becoming an Auditor didn’t interest him. He went on to complete his Professional Qualifying Exams with the Institute of Chartered Shipbrokers to become a Shipbroker. Naidoo also has a Diploma in Marine Surveying from Lloyd’s Maritime Academy through the North Kent College. He joined Safmarine as a graduate and gained invaluable experience as he moved within the business, rotating through finance, exports and imports. Mhlambi obtained his BCom Honours in Accounting at the University Of KwaZulu Natal before completing his articles at KPMG. In 2012 Naidoo proposed that they start their own shipping company. Initially, shipping company Linsen Nambi offered ship broking, marine surveying and consulting services. Naidoo says he conducted shipping business across the African continent, visiting places that included Uganda, Sudan, Mozambique, Namibia and Zimbabwe. “We were a service orientated business and as such we could not scale our business as we did not have assets and could not build a balance sheet. “In 2014 Thuso and I took the decision to pivot our business model to become asset based.” The business took off. The men are in agreement that there is much work that needs to be done within the South African shipping landscape. They feel it “severely lacks meaningful transformation and the economic inclusion of black people is minimal”. It is something they are determined to address within their company, and work towards within the industry. Their disappointment stems from the fact that South Africa is among the stop maritime nations in the world, in terms of the cargo volumes that move across seas. Naidoo adds: “There is a saying in shipping that cargo is king. However, in South Africa, even though we have the lion’s share of cargo, we do not have South African owned ships. China, Japan, Britain and India are examples of other maritime nations in the world with cargo movements such as ours, but which have ships registered in their country. Their vision is sweeping and includes the beneficiation of South Africa’s long coastline. “The oceans can feed us and provide us with a livelihood, yet it remains locked with high barriers of entry for new entrants to participate. “South Africa suffers from a high unemployment rate, yet most black people have never considered working at sea onboard vessels, because most of these positions are not advertised in South Africa,” Naidoo said. 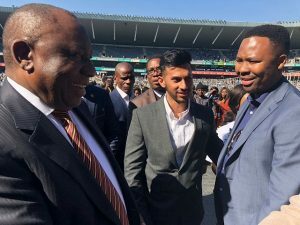 He added that efforts are afoot to change this and that Government has launched initiatives, including Operation Phakisa, to kick start the oceans economy. It is estimated that the oceans can contribute R177 billion to the South African GDP. Said Mhlambi: “They give us the support and trust that we need to run the business.